The diversification of agriculture and urban development encroaching into traditional agricultural areas has resulted in greater need for awareness of the correct methods for applying pesticides. With the diversification of agricultural crops and urban and horticultural areas merging in many locations, there is potential for conflict. This means all pesticide users need to exercise a ‘duty of care’ to ensure label directions are followed to prevent contamination from incorrect application and spray drift into adjacent non-target areas. Farmers need to be aware of their responsibilities, to ensure that the pesticides they are applying involve no risk to others. This requires awareness of label instructions to ensure that the pesticide provides effective control, yet does not concern neighbours, including urban residential areas, alternative crops and aquaculture. Most pesticides are applied with a boomspray and many articles deal with correct setting up of machinery and calibration so that crops receive the correct dose rate specified on the label. In addition, farmers need to be familiar with the effects weather can have, especially the influence of wind or temperature. Spray drift can be a major concern for nearby properties. If pesticide drifts into an adjacent area, either on the same property or a neighbour’s property growing a crop for which the pesticide is not registered, problems can be associated with marketing contaminated product. Grains, fruit, vegetables and livestock have maximum residue levels (MRLs) set for the amount of chemical residue allowed. The Health (Pesticides) Regulations 2011 require a pesticide user to keep, use, handle and transport a product in a manner that might reasonably be expected to pose no threat to the health or safety of any individual or the public. Farmers should regularly review their chemical handling and use practices to avoid off-target damage to their own and neighbours’ crops, while protecting their own and public health. Prior to applying any chemical, farmers are encouraged to complete a basic risk assessment of their handling procedures. This should address method of application, application rates, weather conditions (in particular wind direction and speed) and any other risks which may be present since their last application. Farmers should also consider the likely impact of a chemical moving off-site where it could affect the public. Good practice means producers should be familiar with their neighbours’ crops and livestock. 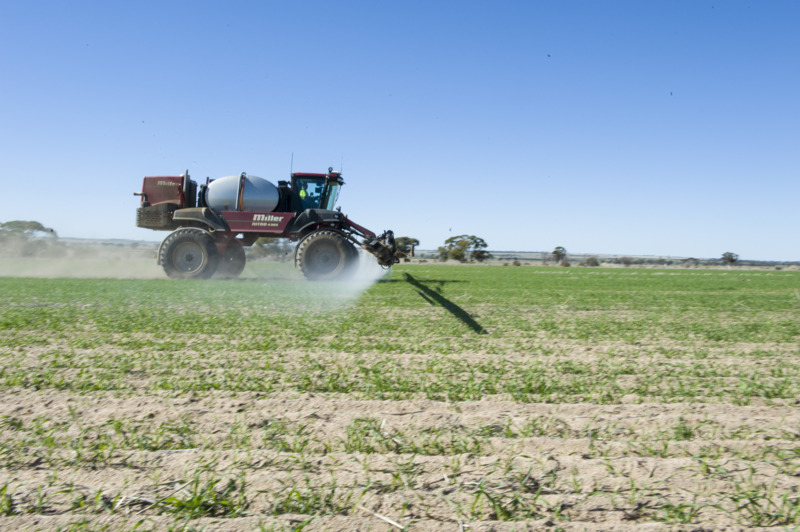 To assist with this, the department has created a register for growers of sensitive crops, aquaculture enterprises and organic food producers to list their property locations on a register so that neighbours can check before spraying. To view this, refer to the Sensitive sites in Western Australia page. Farmers should avoid treating their crop if there is a chance the prevailing wind could cause spray droplets to drift onto a neighbouring property. Only spray when wind speeds of 3–20km/h are blowing away from the neighbour’s property if a sensitive crop is present. Applying pesticides in still conditions, especially late afternoon, may result in considerable amounts drifting under what is termed ‘inversion conditions’. This can occur when the ground cools quickly and a layer of cool air is trapped under warm air. This can be identified by smoke rising vertically and then moving horizontal to the soil surface. Spray droplets can remain in this cool layer of air for some time and travel considerable distances. Most new product labels include the types of nozzles required to produce droplets of the required size to minimise drift. In addition, new label instructions include the required distances between crops being sprayed and sensitive areas. Another way to reduce spray drift is to operate the sprayer at the lowest pressure and height recommended. As part of good practice, growers and their employees should undergo training such as those conducted by AusChem Training WA. Courses usually cover types of pesticides available, toxicity, safe handling, mixing, boomspray calibration, correct mixing, and disposal of waste containers. Understanding chemical labels and awareness of the withholding period (WHP) relating to when a crop can be harvested after treating with a pesticide is also covered. Growers should only apply pesticides in accordance with label directions to ensure the efficacy of the product, to protect their own health, public health and the environment. If you are unsure of the correct application rate or method, seek advice from an agronomist. Spray under desirable weather conditions in particular avoiding inversions. Selecting the correct droplet size (nozzle, pressure). Boom height should be set as low as practical. Boom travel speed should be minimised. Spray when the wind is away from sensitive areas or utilise downwind buffer areas. Spray when there is a consistent crosswind. Spray when wind speed is 3–20km/h.